Now it is end of March. Opening day of the keiryu fishing season of our areas is around the corner. It depends on the area, keiryu fishing season opens at middle of Feburary or beginning of March in some prefectures, but for us living in eastern Japan, opening day of keiryu fishing is mostly 1st April. We had very cold winter in 2018 and had lots of snow falls in the north and north west coast part of Japan. I just pray for not having snow anymore and warm spring because the overflowing snow slows down the fishing season. In early April it is time for our area to celebrate the full bloom of cherry blossoms, a symbol of spring in Japan. Cherry blossoms in full bloom dye cities and towns with light pink color, people walk in parks or street lined with cherry trees looking at the cherry blossoms. The cherry blossoms at night, especially the fantastic atmosphere of the lighted up cherry blossoms is also very beautiful. Cherry blossoms bring the spring to towns, but even in low mountain ranges where we go for keiryu fishing, the trees just start to bud, the mountains are still in winter's dress. Needless to say, the deep genryu is still under the deep snow. However, for us who have been away from the mountain stream for half a year, fishing even in the stream in low mountains and casting the rod in the clear flow is a great pleasure. This time of the year, the trees still have no leaves and the entire river is bright and wading through the stream is nice feeling. We get excited looking at the beautiful body of Yamame. It is the time when we feel the joy of coming spring. In late April the mountains are started to wrap in fresh green at last and the mountain cherries bloom like patchworks on and around the valley. Sometimes the cherry blossom petals fall to the river like snow fall when we wade through the mountain stream. It is a breathtakingly beautiful moment. One day, when I fished one yamame with the beautiful body like that jewel and released her to the river, few cherry blossom petals flew away from somewhere by gentle breeze. I felt the beauty of the spring that is just passing away. 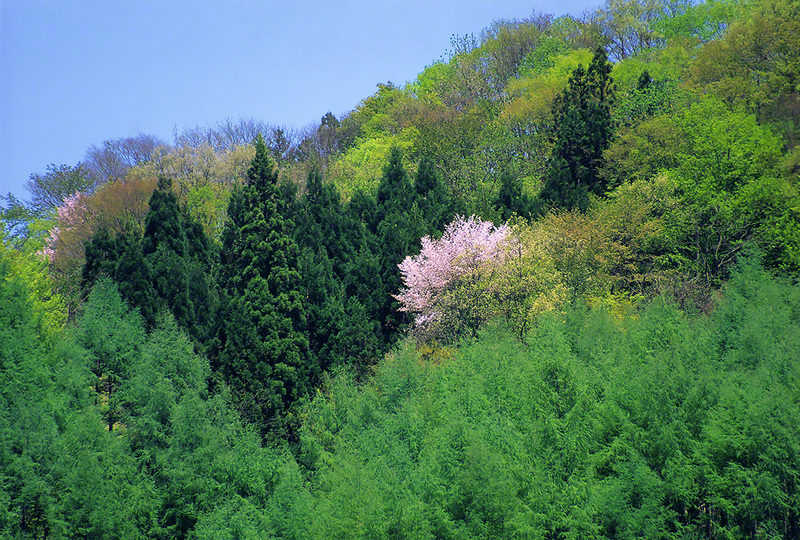 Spring of keiryu as well as the flower of the mountain cherries is over by the beginning of May, then season of early summer comes. There is a consecutive holiday called Golden week in early May in Japan, and a lot of people go out for travel and outdoor activities. This time of the year, the mountains are fully wrapped in light fresh green, and the wisteria flowers bloom all over the valley and amuse anglers' eyes, but full-fledged genryu and high mountains still have snow, and fishing is more difficult due to the influence of run-off. 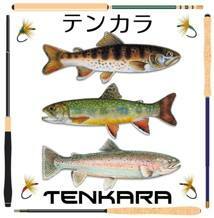 However, it will be possible to enjoy fishing at a region with less snow and genryu in low altitude mountains. We go out to the mountain stream where Iwana can catch from beginning of May. Still we enjoy fishing based on the campsite downstrem of the genryu areas or we just go on a day fishing trip. It is also starting season for sansai picking. We pick many sanaei and taste sansai cuisines at camp. I love the fresh green forest. I feel excited when I think that the season full of life sense will come and we can enjoy genryu fishing in full swing soon. May is the season for planting rice. In the middle of May, rice planting is done in mountain villages where we drive through on the way to the streams. Once when we were on a way home from fishing in the evening, rice fields were filled with water to plant rice. Then, the rice pads were mirroring the moon and stars of the night sky like a mirror. I stopped the car and just looked over the scenery without words. Depending on the amount of snowfall in the year, we go to the first genryu fishing camp of the season at the end of May or early June. We climb over the mountain listening to the cry of Ezo-Haru-Cicadas to the genryu. The mountain streams in high mountains still have influences of run-off, so we normally go to the genryu in the mountains of the Pacific Ocean side with relatively low snowfall. At this time, many mountain vegetables and bamboo shoots can be taken in the mountains of the Tohoku region, and we can enjoy these mountain vegetables dishes at camping. Regarding fishing as well, the Iwana, which still have few anglers yet in that season, have low vigilance and shows a very good response to the fly we cast. Sometimes it is impossible to go to very upstream by being blocked by the snow-bridge, but it is a wonderful season that you can enjoy the pleasant fresh green forest, wonderful fishing and delicious wild vegetables. In June, mountains and forests are completely covered with dark green color. 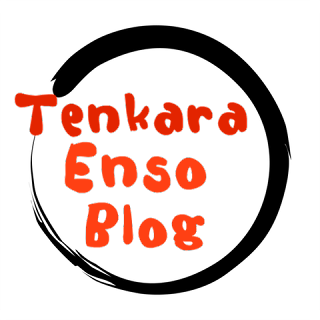 Then the rainy season comes to the Kanto region where we live and to Tohoku region later in 10 days. Since the camping in the genryu struck by rain can not be said to be comfortable, camping fishing in rainy season should be careful of the weather. Rainy season is a hard time for outdoor activities, but on the other hand this rain raises crops and rice. July still continues to be the season of the rain, but the temperature rises steadily and mid-summer comes. 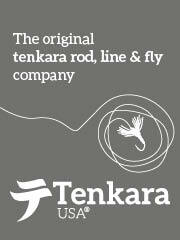 It is a season where you can enjoy a wonderful genryu fishing if the weather is fine. Every year, we go genryu camp fishing trip for 3 days after middle of July when the rainy season ends. In this period, the effects of snow are no longer even in the genryu of fairly high mountains, we can go to the genryu of full-fledged high mountain. If the weather is blessed, the temperature is high under the summer sun, and it is a time when you can enjoy exhilarating fishing by actively entering the river. 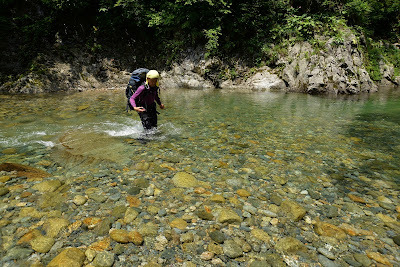 We are fond of challenging to the rugged and beautiful genryu of the Asahi mountains such as Miomote river at this time. 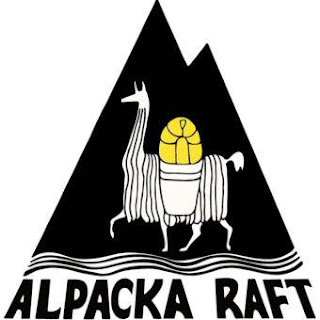 However, in the year when the rainy season has prolonged, it is necessary to pay full attention to the rapid rise of the river due to precipitation and sudden heavy rain. In July after fishing in genryu, when we park the car to buy juice for resting in the mountain village in the evening, we listen to full of frogs' barking sounds coming from the rice fields. It tells us the arrival of mid-summer. It is also beautiful at night when fireflies flying faintly around ridges and irrigation canals by the rice fields. Normally by about 20th July, the long rainy season ends. The schools are on summer vacation, and real summer heat comes. It is the best season to escape the heat town to the cool mountains, but on the Japan Sea side in Tohoku regions which are the main fields of our genryu fishing, large amount of blood sucking horse flies “Mejiro-Abu” occurs from this time. It is impossible to do fishing while being hit by a horde of Mejiro-Abu. Since Mejiro-Abu is active until the end of August, we go to the genryu in Pacific Ocean side or in the pretty high-altitude genryu with low temperature where there is no Mejiro-Abu. The season for genryu fishing in our fields is from April to September for 6 months, but due to, the remaining snow in April and May, Run-off in early summer, and Mejiro-Abu in mid-summer, the comfortable fishing period in the genryu is only about two months in fact. However, it can be said that primitive nature, the river and the fish living there are being protected because the period of this fishing season is extremely limited. As mentioned, in this hopeless Mejiro-Abu season, we go to the genryu where Mejiro-Abu do not live for example in Pacific Ocean side. Camping in genryu of this time is best if there is no Mejiro-Abu. In August, the hot weather exceeds 30 degrees centigrade every day and we have sleepless tropical nights day by day in towns. However, in the mountain villages there is a comfortable coolness that you do not need air conditioners at night. Mejiro-Abu who rages in the summer disappears to somewhere at the end of August. In the beginning of September, we go on an expedition to the genryu that we were most looking forward to during the season. It is the easiest time to enter the tough valleys with high water volume such as Miomote river in Asahi mountains or Kurobe river. Iwana shows a wonderful response to the fly in the genryu, because there was nearly no angler during the mid-summer due to the outbreaks of Mejiro-Abu. Keiryu fishing season ends at the end of September in most rivers. So, in middle of September, as many anglers enter the river to enjoy the last fishing in the season, the nature and the fish 's vigilance becomes stronger, and fishing becomes difficult. From July to September, although we sometimes have typhoons, the weather is reasonably quite stable, the temperature is high, you can enjoy comfortable fishing and camp life. However, at high altitude genryu areas, once the weather collapses the temperature goes down considerably, the bonfire in the camp is essential, clothing needs to be warm enough. Yes, in the mountains, autumn comes over sooner. In the middle of September, you can harvest a lot of mushrooms in the forests along the streams or in the mountains on the way to the genryu. Especially the mushrooms called maitake is the best mushroom that can be found in the forests of genryu areas. We are sure Maitake is the most delicious mushroom that matches any dish such as tempura, miso soup, maitake rice, baked mushroom and any other dishes. Some friends are crazy about searching for Maitake around this time. Iwana lay eggs from October to November. In the latter half of September, we can see Iwana which have already started pairing in various places in the stream such as in the deep pools. Then they move upstream day by day for egg laying. I think that we should not disturb the Iwana at this period. In late September, when the hardwood trees of the genryu forests gradually color, I end up fishing and leave genryu having a feeling of gratitude in my heart. Autumn signs also come to mountain villages in the end of September. Rice fields have reached fruitful season, they rain ears of rice and wait for the harvest. 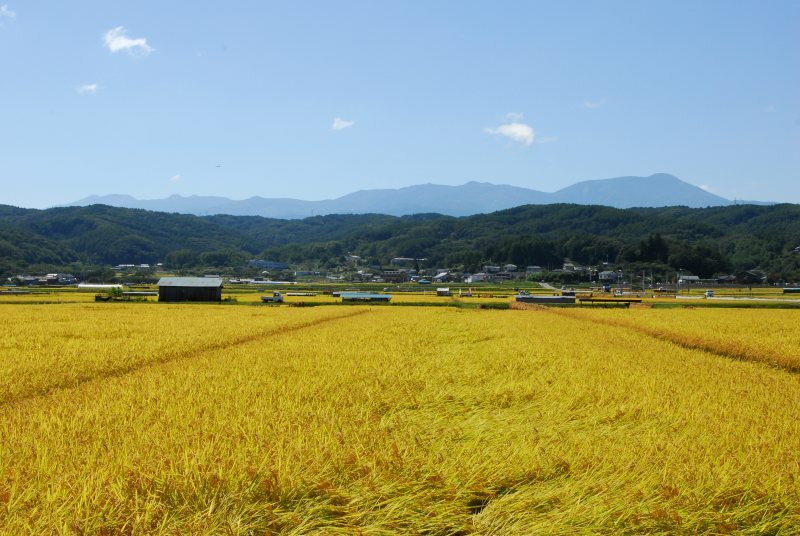 The rice fields in the sun is just like dyed in golden color. We dive home from the last genryu trip of the year through this golden rice fields. I am already preparing for my first fishing of 2018 in the stream near my home-town. I am excited about what kind of fishing trips I will experience this year. The largest advantage of an inflatable canoe is the weight and size. At Thrill Appeal, these types of accessories allow it to be drop-dead simple to pack and go; hiking with them, taking all of them upon spelunking trips, getting all of them together on trips, you name it. A person doesn’t need to worry regarding having a roof stand or even lugging the cumbersome canoe around with you -- this particular version may fit in your own backpack. When we go genryu fishing, the views we see are almost the same as the landscapes of thousands of years ago. 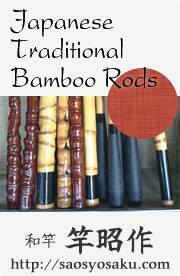 We picked our fishing rods in a wild nature that we have carefully guarded since antique times. I think it is the nature that nurtured the Japanese people for thousands of years. Genryu casting is the fishing done in such holy places.